Time Inc.’s (NYSE: TIME) Sports Illustrated today announced that Cleveland Cavaliers star LeBron James is the 2016 Sportsperson of the Year. In a year full of stirring and historic performances across all sports, James was transcendent, rallying the Cavaliers from a 3-1 deficit against the Golden State Warriors in the NBA Finals to deliver the city of Cleveland’s first championship in a major sport since 1964. James, who has now won three NBA titles, was named Finals MVP for the third time in his career. More important to fans in Cleveland, he delivered on the promise he made when he returned to the Cavaliers as a free agent in 2014: to bring the franchise in his home state its first NBA crown. James will be honored at the Sportsperson of the Year event at Barclays Center, in Brooklyn on December 12. Since 1954, Sports Illustrated has annually presented the Sportsperson of the Year award to the player, coach or team who has best personified the ideals of athletic achievement and sportsmanship. James, who was also SI’s SOTY in 2012, is only the second two-time winner of the award (Tiger Woods: 1996, 2000). The list of past SOTY honorees is a who’s who of the greatest athletes of the last half century who have transcended their sport including Muhammad Ali, Billie Jean King, Arthur Ashe, Michael Jordan, Wayne Gretzky and Serena Williams. This is the seventh time the Sportsperson award has gone to a professional basketball player. The others were Dwyane Wade (2006), Tim Duncan and David Robinson (’03), Michael Jordan (1991), Kareem Abdul-Jabbar (1985) and Bill Russell (1968). James, a four-time NBA MVP and 12-time All-Star, enhanced his legacy as one of basketball’s all-time greats in this year’s NBA Finals. With the Cavaliers down three games to one, he scored 41 points in Game 5 and again in Game 6 to help Cleveland tie the series. In the deciding seventh game, a four-point Cavaliers win on the Warriors’ home court, James had a triple-double, just the third such performance ever in a Finals Game 7. His come-from-behind block of Andre Igoudala’s attempted fast-break layup with less than two minutes to play instantly became one of the iconic plays in NBA history and a key factor in Cleveland becoming the first NBA team to come back from a 3-1 deficit and win the title. James’s impact extends beyond the court. Through the LeBron James Family Foundation the Akron native has partnered with The University of Akron to guarantee four-year scholarships to qualifying children in James’s Akron I PROMISE Network program. Currently there are more than 1,100 students enrolled, the equivalent of more than $41 million in support. His Wheels for Education program supports at-risk third-grade students in the inner city and follows them all the way through graduation and beyond, and last month the foundation established the I PROMISE Institute, aimed at making the transition to college easier for these students and their families by providing the resources and support they need as they pursue their higher educations. Additionally, the foundation recently announced a $2.5 million donation to the Muhammad Ali exhibit at the new Smithsonian Museum of African American History and Culture honoring Ali’s legacy in athletics, activism and beyond. 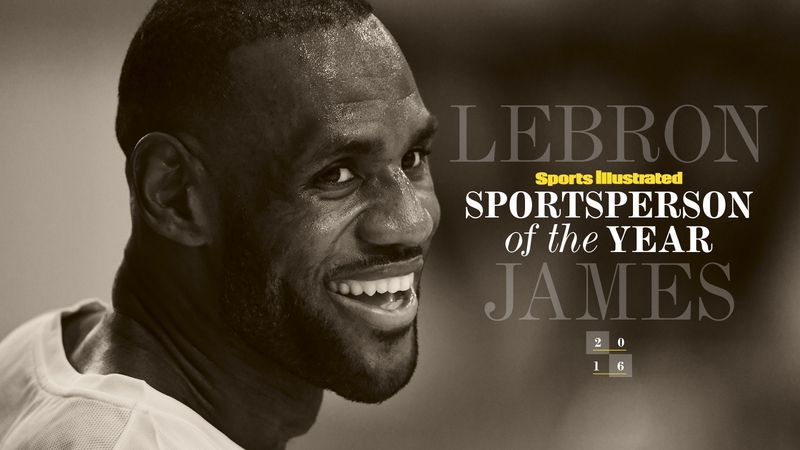 James will be honored alongside the 2016 SI Sports Illustrated Muhammad Ali Legacy Award Winners Kareem Abdul-Jabbar, Jim Brownand Bill Russell; the SI Kids SportsKids of the Year and other top names and moments from the year in sports at SI’s special Sportsperson of the Year celebration taking place at Barclays Center on December 12. The star-studded affair, which will also be attended by Lonnie Ali, will include a special awards dinner and ceremony with tributes to some of the world’s most legendary athletes and special guests. More information about how to attend the event at Barclays Center can be found here. Time Inc.’s Sports Illustrated is the preeminent journalistic enterprise covering the world of sports both on and off the field. Debuting in 1954, SI has garnered worldwide acclaim for its award-winning storytelling born from an independent voice and for its unparalleled access to the most popular athletes and newsmakers from the sports world. This is the underpinning of the franchise, which now boasts a group of best-in-class consumer products and platforms reaching more than 73 million. The Sports Illustrated Group features the most-read sports magazine, a top 10 sports digital network and marquee franchises—Sports Illustrated Films, ‪TheMMQB.com, the FanSided Network of sites and apps, Sports Illustrated Swimsuit, Sportsperson of the Year, the SI Golf Group (Golf magazine, ‪Golf.com, SI Golf +), Extra Mustard and Sports Illustrated Kids. For more information, visit ‪SI.com and follow @SINow on Twitter, @SportsIllustrated on Instagram and Facebook and SI_mag on Snapchat. Time Inc. (NYSE: TIME) is a leading content company that engages over 150 million consumers every month through our portfolio of premium brands across platforms. By combining our distinctive content with our proprietary data and people-based targeting, we offer highly differentiated end-to-end solutions to marketers across the multi-media landscape. Our influential brands include People, Time, Fortune, Sports Illustrated, InStyle, Real Simple and Southern Living, as well as more than 50 diverse titles in the United Kingdom. Time Inc.has been extending the power of our brands through various acquisitions and investments, including Viant, an advertising technology firm with a specialized people-based marketing platform, The Foundry, Time Inc.’s creative lab and content studio, and the People Entertainment Weekly Network (PEN). The company is also home to celebrated events, such as the Time 100, Fortune Most Powerful Women, People’s Sexiest Man Alive, Sports Illustrated’s Sportsperson of the Year, the Essence Festival and the Food & Wine Classic in Aspen.